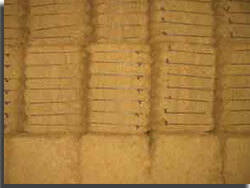 Size of the INDUSTRY Total world coir fibre production is 250,000 tonnes. Today India, mainly the coastal region of Kerala State, produces 60% of the total world supply of white coir fibre. Percentage in world market India, mainly the coastal region of Kerala State, produces 60% of the total world supply of white coir fibre. The history of Coir in India started with the association of Kerala state which dates back to the 19th Century. Between the Western Ghats on the east and the Arabian Sea on the west, Kerala is one of the most beautiful states of India. A tropical paradise of waving coconut palms and wide sandy beaches, this thin strip of coastal territory slopes down from the mountain ghats in a cascade of lush green vegetation and varied fauna. One of the most commonly seen tropical trees in Kerala is the Coconut tree. In fact, even the name Kerala (Kerlam in Malayalam) is derived from this tree ("Kera" in Malayalam language means Coconut and "Alam" means Land, thus Keralam = Land of Coconut). Everything from Kerala's culture to its dishes is evolved around the Coconut tree. Today Indian coir industry has come a long way from manufacturing simple ropes to various high-end lifestyle products. 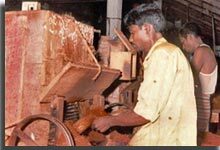 India established its first coir factory in Alleppey and one James Darrah, initiated the process of professionalism and modernisation in an unorganised sector. Over one hundred and forty summers ago, when James Darrah decided to establish a coir factory in Alleppey, he might not have visualised the kind of revolution he was launching in a strange land. The Europeans had entrenched themselves in Indian subcontinent and political revolutions of different hues were being enacted in various parts of India. But the one that Darrah launched by establishing India's first coir factory in 1859-60 in Alleppey, popularly known as the Venice of the East, was one that has changed the face of Indian coastal belt. In India coir making is largely a dissipated industry with households producing miniscule quantity of products. They hady established an appeal of fibre by retting and then beating coconut for the interior husks. In India produced fibre and many as 1,402 of the 1,831 coir units in yarn hardly bothered about the advantages Kerala where in Alleppey, establishing the of professionally organising their traditional coastal town as the unchallenged headquarter of coir-making capabilities. The golden textured Indian coir fibre, which Andhra Pradesh, Odisha and Goa produced captured the European and world markets. From then on, there was the success of Indian coir's reign and it had no turning back. The big corporates soon established coir factories in Alleppey, Kollam, Kozhikode, Kochi and other parts of Kerala. Industrial giants including Volkart Brothers, William Goodacre, Pierce Leslie and Aspinwall moved in to tap the potential offered by the golden fibre, and Alleppey was soon a household name all over Europe and India. By 1967 the "Golden Fibre" had captured the European and the world markets. Today the Coir Goe-Textiles or coir Bhoovastra has shot into the lime light which are mainly due to its eco-frinedly characteristics. They are being usually effectively used for improving soil bahaviours, preventing soil erosion, and in helping consolidation of soil. Coir is a 100% organic and bio-degradable fibre which has great water absorbency and has a definite edge over synthetic goe textiles, in the environmental aspect and issues. The greatest advantage of Coir is that it provides an ecological niche for rapid establishment of vegetation. Coir being the geo-textiles come in a mind-boggling range of woven and non-woven varieties available for bio-engineering,including geo meshes,girds, geo-beds, anti-weed blankets, needled felts, erosion control blankets, geo-rolls, geo-webs, and fascines. The main reasons that helped the establishment of the coir spinning industry in Kerala are the presence of brackish backwaters and lagoons of the state. Brackish waters had to be replenished by fresh water at frequent intervals to wash away the water contaminated in the process of retting of husks, and Kerala was naturally endowed with this facility. This made an essential establishment of the the industry so firmly in India and particularly in kerala, even though coconut production was significantly high in several other countries like Indonesia, Philippines, SriLanka and Thailand. Indian coir industry is keeping pace with the change in technology and imbibing the latest developments in production techniques and designs. Indian coir industry has been fortunate to get boost in the form of the ever increasing awareness about eco-protection. Coir, being a natural fibre which is environment-friendly in the strictest sense of the term, is the fibre of the future today. The eco-friendly quality of coir will help it to hold its ground even as it battles competition from synthetic fibres in todays developing world. The development of geotextiles, which helps protect the soil and in turn the environment, by acting against soil erosion, is the best advertisement for coir in recent times. The Coir Industry in India has a strong position in the export orientation since the early days, when trade was dominated by European companies. At the beginning of the independence of the local trade in the hands came a turning point in the history of the coconut industry in India. Structure of production and relations has changed significantly. The pattern of exports and product mix has changed very much drastically. With the level of fiber and yarn exports, India is an exporter of goods with added value. which in turn led to a significant change in total volume and value of exports. During the year 1950 the average export volume dropped to 73,200 tonnes per year and then in the year 1960 the export volume decreased to 62 300 tonnes per year. It was back to 45 700 tonnes per year in the 1970's and 26 700 tonnes in 1980. From an average annual export realization of Rs.80 million in 1950 of Rs.120 million in 1960, Rs.210- Rs.300 million in 1970 and 1980. Until the mid-90's it was Rs.1,710 million in sales to Rs. 3,400 million in 2003. At present, coir and its products are exported to more than 80 countries and the US is the single largest market with a share of more than 40% in the total export. European countries together share more than 41 % of the exports. Not only that the Coir Board have also participated in 11 international trade fairs and exhibitions during 2005-06 and displayed the range of products available for exports from India. Coir Board in India is a statutory body established by the Government of India under a legislation enacted by the Parliament namely, Coir Industry Act 1953 for the promotion and development of Coir Industry in India as a whole. Kerala is the home of Indian coir industry where white fiber, accounting for 61% of coconut production and over 85% of coir products are from women. With 10.05 lakh hectares having coconut cultivation in Kerala, which accounts for 45% of the net cropped area. The coconut out put is estimated at 5759 million nuts annually. Total world coir fibre production is 250,000 tonnes. Today India, mainly the coastal region of Kerala State, produces 60% of the total world supply of white coir fibre. Sri Lanka produces 36% of the total world brown fibre output. Over 50% of the coir fibre produced annually throughout the world is consumed mainly in India. Together India and Sri Lanka produce 90% of the 250,000 metric tons of coir produced every year. Recently countries such as Mexico, Indonesia, Vietnam and certain Caribbean countries have started to supply to the global market in large scale. Coir exports from the country have already exceeded the target in 2005-06 and have also registered an increase of 11% in quantity and 7% in value over the previous year. Exports had touched an all time high level of 1,36,027 tonnes in volume and Rs 508.45 crore in value against the target of Rs 490 crore set for the year 2005-06. During 2004-05, exports were of the order of 1, 22,927 tonnes at Rs 473.40 crore. So the Coir Board has set an export target of Rs 560 crore in the current fiscal. Indian Coir Industry employs more than 1.5 lakh weavers and 4 lakh spinners. The industry has been going through a bit of rough patch because of the lack of modernisation and marketing effort. Indian Coir industry is second to agriculture as a source of employment in Kerala, providing employment to 3.83 lakh persons, of whom 3.25 lakh are women. Indian coir industry has a phenomenal share of 89% of the global market for value-added coir products. The export has increased from Rs.250 crore in 1997 to Rs.314 crore during 2000-01. Equally significant is the fact that most of these people are from the economically disadvantaged classes and 80% of the workers are women. The minimum export price (MEP) appears set to be scrapped as coir makers and exporters get geared up to face competition of the WTO and global markets. The Indian coir industry, that many thought was breathing its last in the early Nineties, is waking up to a new dawn and moving ahead with success which can be called as the great Indian rope trick. Recently, the Export Market Development Assistance Scheme of the Board had been modified to encourage more small exporters of Coir with an export turnover of less than Rs 2 crore to undertake promotional measures like participation in exhibition, study tour, buyer seller meet, etc. Even with a view to encouraging the sale of coir and coir products through the outlets of co-operative societies and the PSU's, the Coir Board has been granting Market Development Assistance (MDA). During 2005-06, an amount of Rs 170 lakh was disbursed by way of central share of MDA to various state governments.